Originally from London and with 25 years of licensed trade behind us, we made the huge decision to move South in 2004 to work with St Austell Brewery. Our career to date had taken us all over central London and the Home Counties, so it was with a bit of trepidation we took over the management of one of their most prestigious sites. The Harbour Inn, Porthleven. Our love affair with all that is Cornish began there in Porthleven. Parents to 2 daughters, we instantly knew this was a match made in heaven. Working for a family focused company, who valued our personal time as well as our professional time we soon settled into village life. Following a successful time at the Harbour we decided that we were ready to take on our own business and started looking for the right pub to take over as tenants with St Austell Brewery. When we came to The William IV, we asked ourselves, if we were in a vibrant town shopping, sightseeing, out for a meal, going to the theatre or Cinema, or just a good old catch up with friends, what would we want to find in a pub? We very much knew what we didn’t want which a branded operation with robots for staff, pre-cooked was bought in food, served by disinterested people, where standards were not high on the agenda. We knew we wanted The William IV to be right at the fore front of customers’ minds when they were deciding where to go when in Truro. Our focus is to deliver the best food and drink in a clean and safe environment with exceptional customer service as a standard. We are proud to employ a sociable, enthusiastic, exceptional team of people to deliver those standards over and over again. All of them have achieved World Host Customer Service Awards recently, what an achievement! We are now coming to the end of our sixth successful year at the William IV. It has been fun, getting to know all the characters that Truro has. We have seen the dreaded road works by South West Water come and go, many new bars and restaurants open while some sadly closed. Truro is a diverse city and we like to think we have found our niche within that city, WE ARE A PUB and a good one at that. 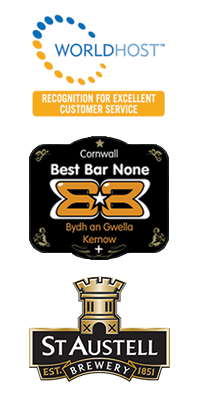 Next time you are passing pop in and say Hello, sample our hospitality, Try one of our famous William burgers, a cool glass of wine or one of our award winning St Austell brewery range of ales. Whether you are local, on holiday, working or just passing through, we look forward to welcoming you.